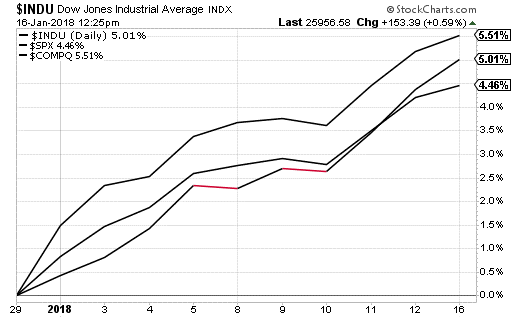 Just because the year now has an “8” at the end of it, the stock market doesn’t care. Share prices continue to party like it’s… well, 2017. The S&P 500 just enjoyed its best 10-day start to a year since 2003, notching a gain of over 4%. As I write, the Dow, Nasdaq, and S&P are all up around 5% so far this year; possibly higher by the time you’re reading this. Stocks are being powered by a strong corporate tailwind, with profits among S&P companies projected to have jumped by 11.2% during the fourth quarter, according to UBS. That would mark the second-best earnings period since 2011. And FactSet says all 11 S&P sectors are expected to have notched both revenue and earnings growth – the first time that’s happened since 2011. Such strong growth is hardly an outlier, either. The fourth-quarter forecasts come on the back of a stellar year for S&P earnings – up 15.5% in the first quarter, 10.8% in the second, and 7.1% in the third. Following a 3.1% annualized expansion during the second quarter of 2017, the third quarter saw 3.2% growth – the fastest pace in two years. And the New York Fed expects the fourth quarter number to roll in close to 4%. Looking ahead, while the Fed is expected to keep raising interest rates this year, the recent corporate tax cut from 35% to 21% should keep profits robust. A strong economy and tax cuts bode well for all companies – but it’s particularly good news for transportation companies, who are quite literally the engines of economic growth. Need proof? The Dow Jones Transportation Index chalked up a 17.3% gain in 2017. It’s up another 7.1% so far this year and continues to notch new highs. Founded in 1884, the DJT is the oldest index – and is showing that age is no impediment to stellar performance. Knight-Swift Transportation (NYSE: KNX): In April 2017, Knight Transportation and Swift Transportation agreed to merge. The deal created a company with a combined $5 billion in annual revenue. And with a combined 100,000 trailers and tractors, it’s also one of the largest trucking and freight logistics companies. The deal is expected to add $100 million to earnings this year and comes at a time when not only is the U.S. economy strong, but as e-commerce – and the shipping that results from it – continues to grow. According to the Truckload Freight Index, volume and operating ratios are projected to rise this year. Numbers-wise, net income growth and profit margin are in-line with the industry average – but that should grow as the two companies contribute to the bottom line. The stock has performed strongly over the past couple of months and a relative strength indicator of 61 suggests there’s still some room to run. 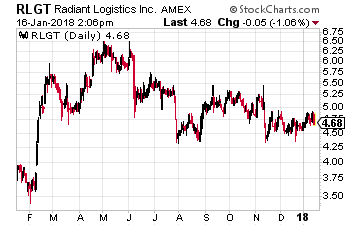 Radiant Logistics (Nasdaq: RLGT): With a market cap of just $232 million, this isn’t one of the sector’s big, established names. In fact, the company was only founded in 2001. It operates U.S. and international air freight and ocean shipping services, trucking, inter-modal shipping, freight and customs brokerage, inventory services, and order fulfillment. And it move goods in a variety of areas, including manufacturing, consumer goods, food and drink, healthcare, and technology. While Radiant can’t compete with the bigger players in the space, it’s nevertheless carved out a model that works. Over the past five years, average sales and net income growth have risen by an average 20% per year. And while the past quarter saw only a slight uptick in sales and a drop in earnings, the stock is slowly beginning to recover. A PEG ratio of 0.7, indicating that shares are undervalued, relative to earnings growth. 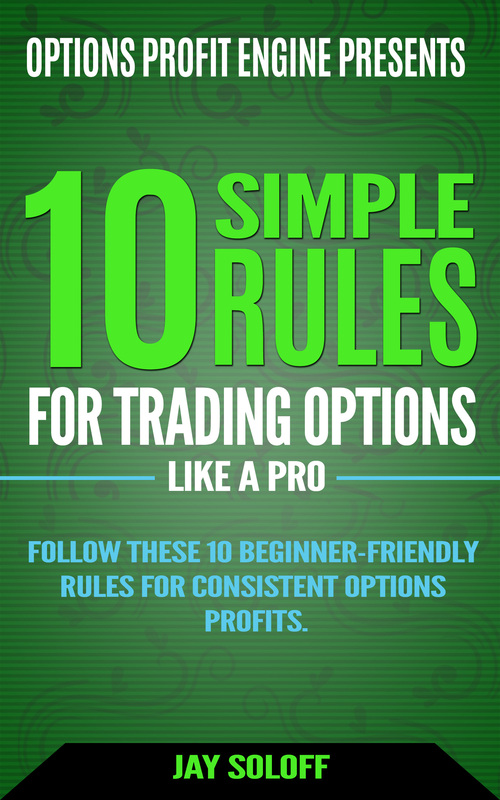 A beta of just under 1.0, which means the stock is slightly less volatile than the overall market. Insider ownership of over 30%. When company insiders own a healthy chunk of shares, it’s a powerful bullish indicator. After all, why would they invest their own money if they weren’t confident of success? 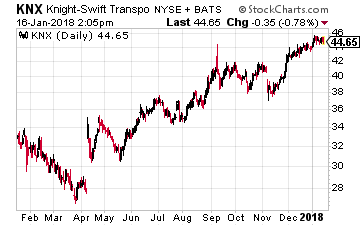 Overall, transportation stocks are sometimes overlooked in favor of trendier growth stocks. But with the dual tailwinds of a strong economy and corporate tax cuts, the prospects for 2018 look attractive. The corporate tax rate changes have effectively cut taxes for most corporations by around 40%. That’s a big deal for companies tied directly into the coming revolution called The Singularity. It’s transforming industry, government, education, jobs, transportation, and communication… every aspect of our modern society is being affected. It’s been estimated that The Singularity represents of $100 trillion (not a typo) in wealth creation of the next seven years. The question is whether you’ll get your share of that $100 trillion. Check out my new FREE report, “The Industrial Singularity”, and I’ll show you how to get your hands on your part of $100 trillion. Click HERE.